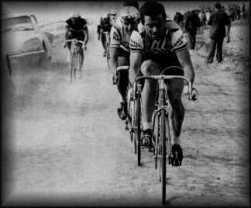 The 1982 Paris-Roubaix was one long dust storm. As the race sped across the northern French plain its path could be tracked from miles around by the dust clouds it raised. 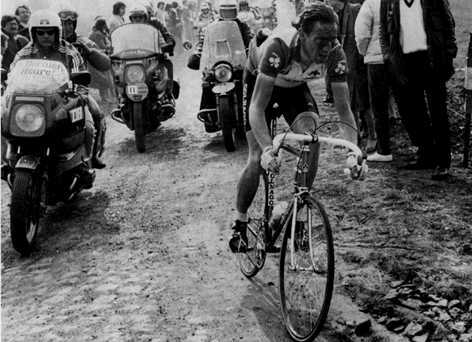 Jan Raas won, speeding into the track at Roubaix to win alone. I found these photos while researching the Raas feature and thought I'd share them with you. 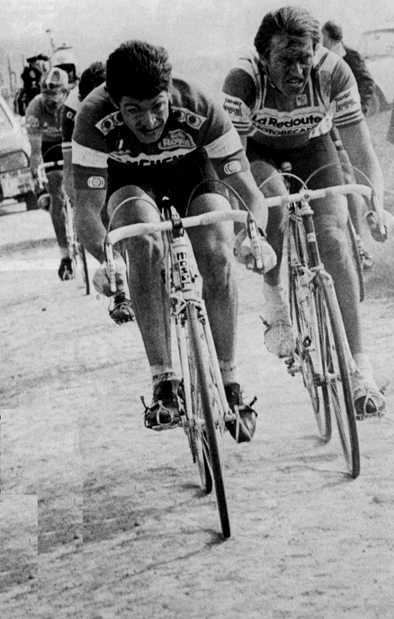 Francesco Moser leads Jean Luc Van den Broucke in the chase. 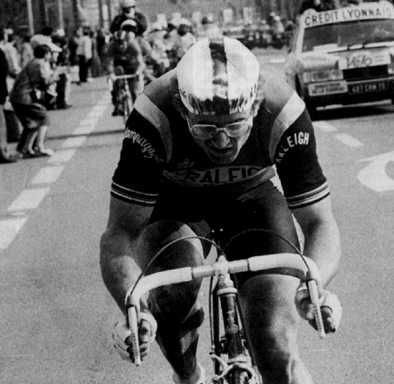 Jan Raas takes his chance on the run in to Roubaix. 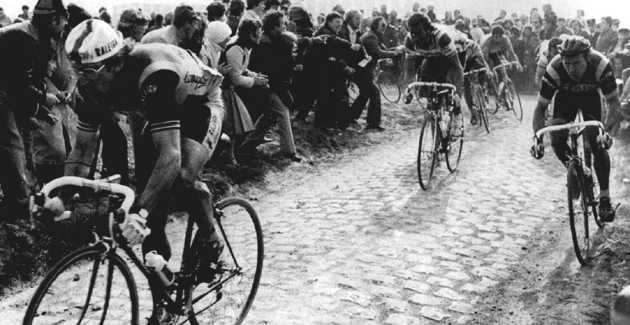 Bernard Hinault kicks up the dust for Henni Kuiper and Roger de Vlaeminck to swallow. 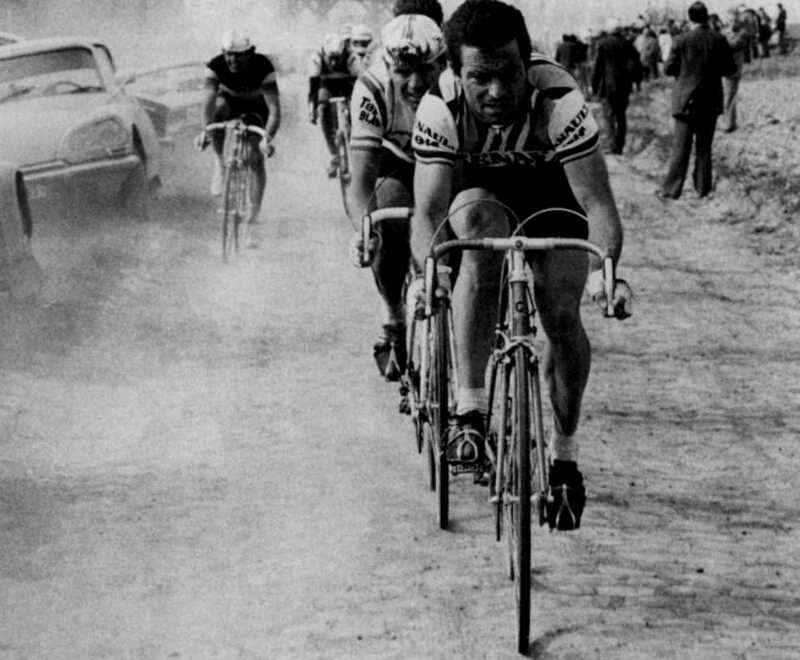 Danny Willems fights his way over the cobbles. These pictures have been reduced in size for ease of loading. They are also buttonised. If you would like to view a (non-buttonised) picture at its full size, simply click on it or the text link beneath it. Jan Raas and team mate Peeters set a hot pace over the cobbles. 3 Gregor Braun |(Capri-Sonne) s.t. 4 Stefan Mutter (Puch) s.t. 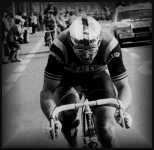 6 Roger de Vlaeminck (Daf) s.t. 7 Marc Sergeant (Boule d'Or) s.t. 8 Ludo Peeters (Raleigh-Campagnolo) s.t. 9 Bernard Hinault (Renault-Gitane) s.t.